Councillor Yani Johanson and I got out today around a stricken area that we had only recently heard about. Flesher Ave in Richmond was hit hard. We spoke to many local residents. Those who were home were pretty upbeat. A couple of calmer aftershock days and half a day of sunshine had lifted spirits. But around half of the homes were empty. Not surprising given how hard this street was hit. Flesher Ave remains impassable, with a sunken section filled with water halfway down the street. We chatted with a wharfie who owned one house we visited. He said that when he went out on the street about 15 minutes after the quake, he thought the nearby Avon River had flooded into the street. 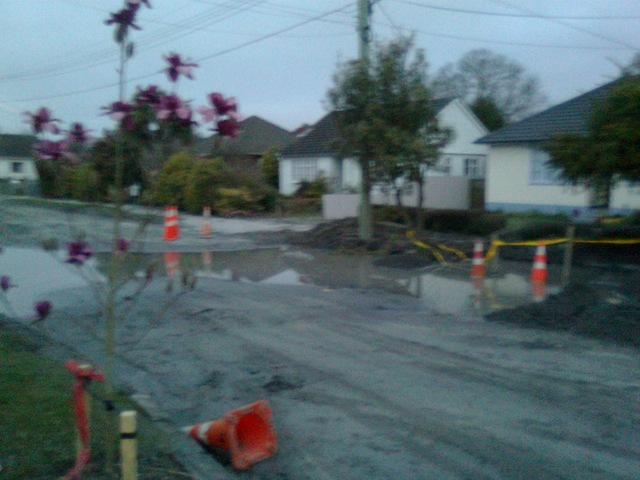 But it was the, now notorious, liquefaction effect swallowing the road and spewing water and silt. A vehicle was nearly buried. The state of his street only added to the stress that he was under. Over in Lyttelton the port suffered millions of dollars of damage. The piles under the container wharf were affected, cutting port capacity by 50%. On top of that, alternating closures of the road tunnel and the Evans Pass route meant he has had several days of not knowing whether he will get home from work. Flesher Ave was originally a state housing street. Now largely in private ownership, with a lot of investment in home improvements, a high proportion of the houses had chimneys crash through the tile roofs. Some concern was expressed about the city council building inspections. More than one resident, though relieved to get the green “safe” sign on their house, noted that the inspection seemed very cursory. One lady said her husband, an architectural designer, commented that the inspectors did not seem to know what they were doing. 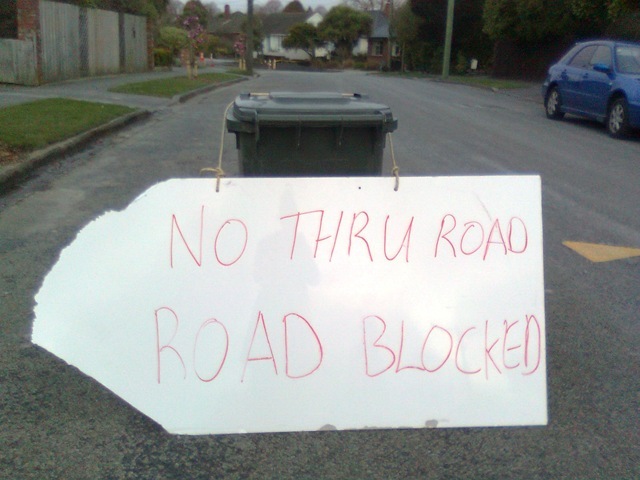 We were bemused by this sign in the middle of the road. Apparently a local resident had erected it to make up for the shortfall in council signage. There was an official “road closed” sign at the other end of the street. Yani and a number of residents were struck by the irony that, just days before the quake, the street had been planted with new trees. Yani had lobbied at council on behalf of a resident petition for these trees to be planted. They are now blossoming. We don’t know whether they will all survive the silt onslaught. Excuse the quality of this picture, we were losing daylight at this point, but you can see the pink blossoms and the wrecked road.